Why do I feel worse on the GAPS diet?? I see many patients in my clinic who have tried the GAPS diet without knowing they have histamine intolerance. They dedicate a lot of time and energy into following the meal plans correctly, making their own bone broths and fermented foods in the hope that they are going to heal their gut and feel so much better. However, no matter how hard they try, they progressively feel worse and worse. In this latest blog, I discuss why the GAPS diet is not ideal for some people. GAPS refers to ‘Gut and Psychology Syndrome’ is a specific type of eating plan designed for the treatment of inflammatory bowel disease, leaky gut syndrome, depression, anxiety, autism, ADHD and autoimmune disease. The first part of the GAPS diet involves eliminating certain foods, and increasing your intake of specific foods designed to heal the gut. These foods are considered to be inflammatory; they disrupt the normal balance of gut flora and cause a leaky gut. This can lead to autoimmune conditions, as well as depression and anxiety. These foods are considered to be anti-inflammatory and contain specific nutrients that heal the gut wall and balance the gut flora. BUT my symptoms are getting worse!!!!! WHY??? There are several foods on this list that are VERY high in histamines including bone broths, slow cooked meat dishes, prebiotic rich foods (fermented vegetables, sauerkraut, kimchi) and avocado. For some people histamines can be a huge problem. Why do I have problem with histamines? Poor gut function – an unhealthy gut can also increase histamine in the body. 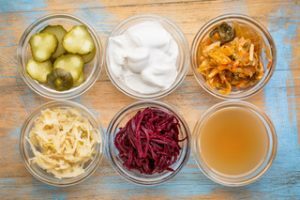 Many foods increase histamine in the body including fermented foods (soy, miso kimchi, sauerkraut), aged cheeses, alcohol, yeast, shellfish, canned tuna, processed meats, chocolate and tomatoes. The GAPS diet can be extremely healing for some people, however, not everyone will be able to tolerate the high histamine foods that make up a significant part of this eating plan. If you have experienced issues with histamine foods, you may benefit from working with a naturopath or nutritionist to develop a specific meal plan that will heal your gut without causing adverse side effects.